OQO, a Ultra-Mobile PC (UMPC) specialist introduces the next generation UMPC, the model 02, showcased by Bill Gates in his keynote address at the Consumer Electronics Show in Las Vegas. With weight of just about one pound and dimension of 5.6″ x 3.3″ x 1.0″, and as the the first computer in the UMPC Pro category as well as the successor to OQO model 01, the OQO model 02 is also dubbed by OQO as the world smallest Windows Vista Capable personal computer. The model 02 is up to four times faster and has a display more than six times brighter than its groundbreaking predecessor, the model 01+, and has been redesigned from the ground up. 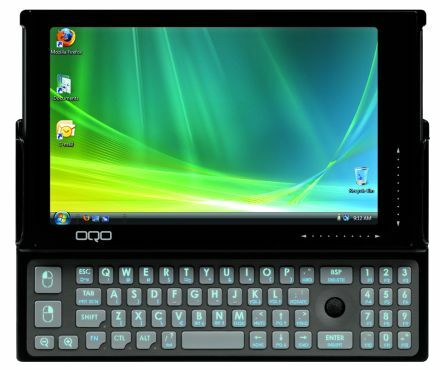 The OQO model 02 with pocketable ultra mobile form factor incorporates 1.2GHz or 1.5GHz VIA C7M VLA ultramobile processor, and features 30GB or 60GB hard drive shock-mounted with active drop detection, 512MB or 1GB DDR2 SDRAM, 5″ 800 X 480 native but interpolated up to 1200 x 720 indoor/outdoor readable LCD display, HDMI output for connectivity to HDTV displays or DVI monitors up to 1920 x 1200, VGA output through bundled VGA/Ethernet adapter for analog monitors up to 1920 x 1200, DisplaySense for detection and recall of external display settings, ergonomic thumb keyboard with SmartLock modifier keys on ergonomic backlit keyboard, mouse buttons and integrated track stick pointing device, integrated capacitive TouchScrollers for horizontal and vertical scrolling, integrated EV-DO WWAN for Sprint, WiFi 802.11a/b/g, Bluetooth 2.0 wireless with EDR with A2DP support, USB 2.0 port, 3.5mm audio out jack, line-in port, microphone port, integrated active digitizer with optional digital pen, up to 6 hours of battery life, embedded hardware AES encryption engine, integrated TPM 1.2 (Trusted Platform Module). OQO model 02 is built on rugged magnesium alloy chassis, and covered with removable screen protector. Every model 02 is configured with OQO’s breakthrough software that provides one touch access to many of the computer’s settings and functions including the ability to change screen resolution on- the-fly with dedicated zoom keys, and Origami functionality. Beside, the model 02 also features a docking station that based on OQO’s patented cradle that able to adjusts the model 02 position for desktop viewing, and can also easily collapse for portability. The docking station contains adjustable docking cradle, dual layer DVDRW/DVD-RAM or CDRW/DVD-ROM optical drives, HDMI digital video out with bundled HDMI-DVI adapter, VGA video out, 3 USB 2.0 ports, 100 Base-T Ethernet, audio out and line-in port. The OQO model 02 is selling from the base price of $1,499.